My kids don’t exactly object to getting out of bed early. It’s more like they’re incapable of functioning without precise guidance before 8am. Each insulating layer requires new instructions. Putting on socks does not, apparently, imply that shoes should follow. In spite of this, we made good time up the Thruway on Sunday. We arrived at Windham, parked, grabbed our gear and jumped on the shuttle bus. I left the kids to boot up while I got our lift tickets. Junior made it to Hunter’s opening day with me, but Sunday was my 10 year old’s first day of the season. He’s stepping up to a longer pair of skis this year, so we got on D-lift, a fixed grip triple to start out mellow. The little grom did great but I noticed he was skiing really slowly. 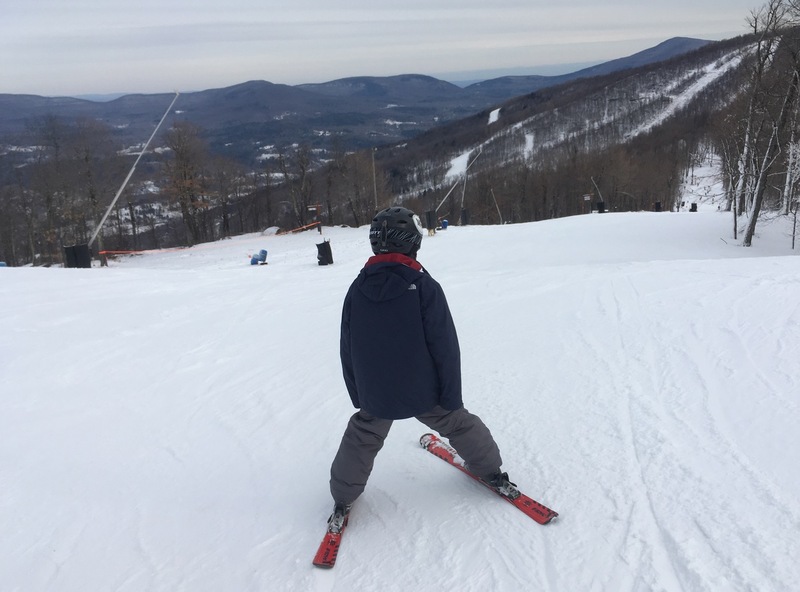 I encouraged him to do some parallel turns and point his skis down the fall line. He’s notorious for going back to a snow plow under the slightest provocation, so at first I chalked it up to caution. Halfway down I realized he was the victim of a bad tune by dad. I used a card from my wallet to scrape off the excess wax and after that he was fine. We did a couple of runs off the triple; mixing with beginners and some from the adaptive ski program. Then we jumped on Whirlwind Express, the detachable quad to the top. We hit Upper and Lower Wraparound and then did a few runs on Warpath, Chute and Whistler. By midday both sons were in mid-winter form. Windham had four routes down from the top with wall-to-wall coverage. The snow was was soft with no bare spots and very little ice. We were skiing primarily on manmade with a little natural mixed. The thin coating of white on the closed terrain and in the trees improved the atmosphere. 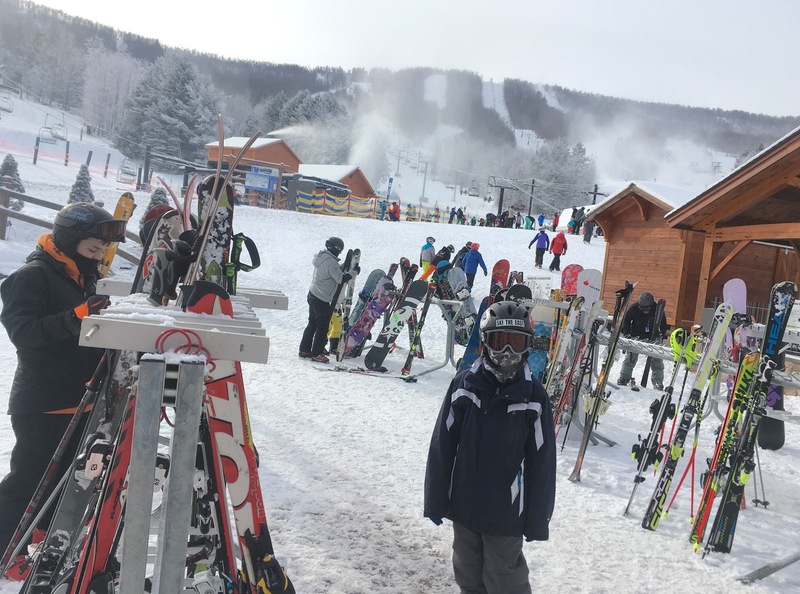 At opening it was 12 degrees and the mountain had snow-making going full tilt, towers and fan guns, mostly on closed trails. 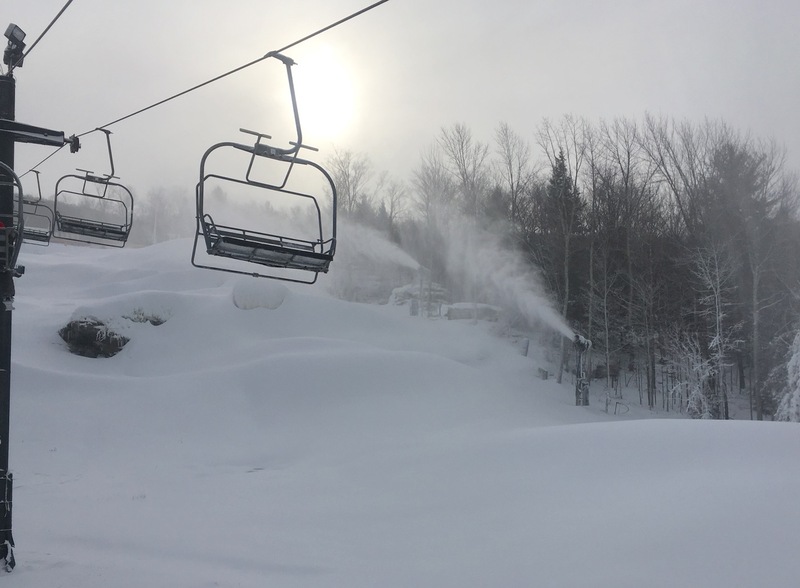 They delivered a solid early season experience and significant terrain expansion is right around the corner. Looks like Windham is going to have a good Christmas. Around noon, my boys called for a break. I set them up with lunch, bolted a cup of chili, and headed back out by myself to sample the open expert terrain. I had a good time and found Windham’s black terrain to be plenty entertaining. I love seeing steeper terrain open this early in the season. Like the rest of the mountain, there was good soft snow to ski. 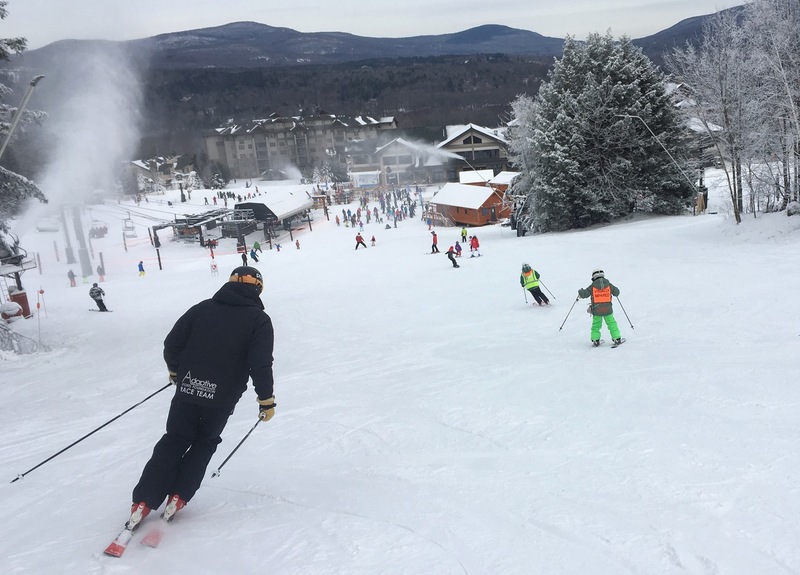 I did some fast laps to skiers left of the quad before retrieving the boys and spending the afternoon racing them down from the top of the triple. This is a sport for the end of the day or Sunday afternoon when things clear out early. We handicap our races: the youngest gets to start first and Junior goes next. Then, after a little while more, I start. The interval is based on the length of the trail we’re on. If we get the intervals right it makes for an exciting finish. Another great day this season. I was also there on Sunday with my son. Not bad for early season. 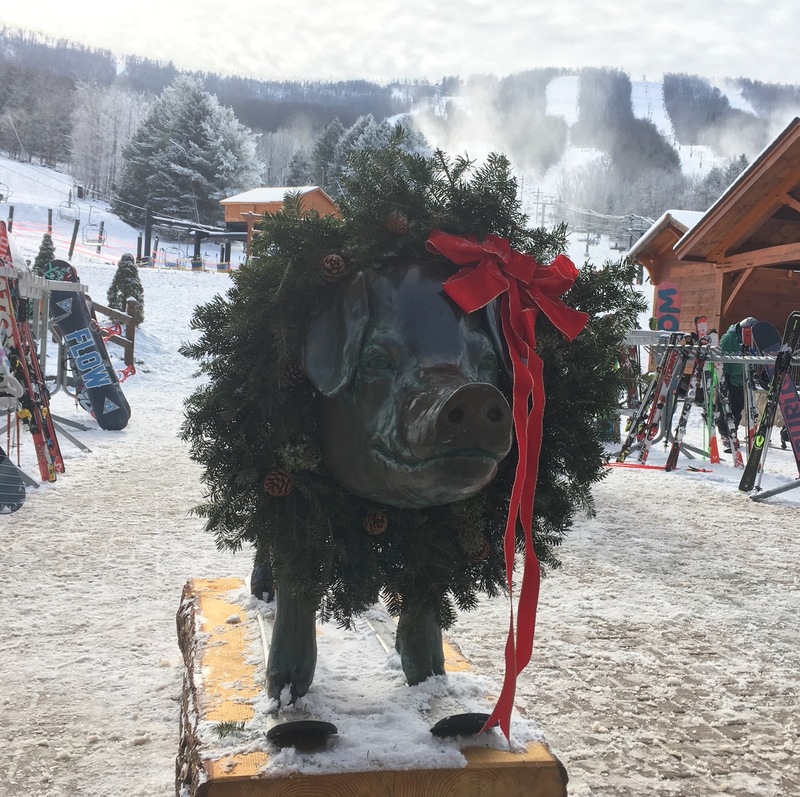 We love Windham , though my family always skied Huntah as we have family that are close with the original owners of the mountain. Also, the fact that they had made so many great friends there over the years. Windham, the times we skied it, we loved it. Its been at least 18 years since were were there. Maybe tim to pay them a visit though, not sure if it will happen this year. Also, we agree that getting the kids up early is hard for us though lately not for skiing. It’s early season so, they are excited now. And considering what happened last year with the weather… With snow now, they are going for it early.